Mighty Ocean, ex front-man for Driftwood Allies, has dusted off his acoustic and gone solo. With a new found freedom and inspiration to weave a captivating web of vocals, guitar and stomp box, loops and sequenced beats designed to cover most crowds from diners to dancers. Mighty Ocean has built on solid foundations in the coastal music scene. 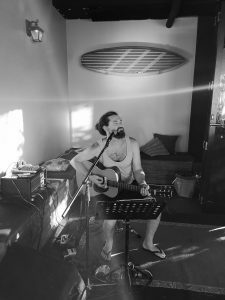 Having played with such musicians as Nicky Bomba, The Red Eyes, Ebb n’ Flo and Richie Williams, Mighty Ocean continues a long line of singer/surfer/song writers playing the NSW east coast. Here's another live recording from the Mighty Ocean song book with loops n' beats.